Obituary for Edith R. Roberts | McGuire Funeral Service, Inc.
Edith R. Roberts, 94, peacefully entered into eternal rest at her home, surrounded by those she loved. 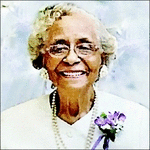 She is survived by four children, Horace M. Roberts, Audrienne Roberts Womack (Thomas J. ), Marilynn E. Martinez and James Roberts; sisters, Rebecca Hairston of Cleaveland, OH and Dorothy Walker of Pittsburgh, PA; twelve grandchildren; five great-grandchildren and a host of other relatives and a multitude of friends.